If you want to win friends and influence people, you could read Dale Carnegie’s book and get some excellent advice. 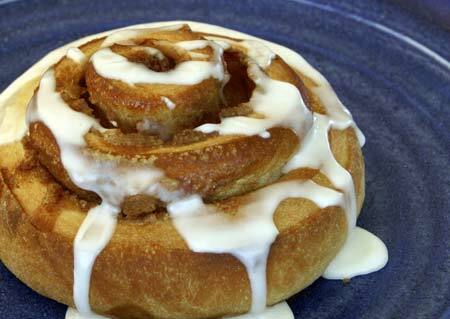 But I’ve found a faster way: bake cinnamon rolls and sticky buns. Arouse in the other person an eager want. Simply pulling these rolls out of the oven should do the trick. See how that works? They will be putty in your hands. You can of course tailor the recipe to your own tastes and those of your influencees. Substitute another spice, or a combination of spices, for the cinnamon. 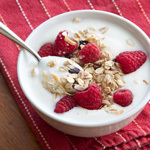 Add chopped dried fruits to the filling. Try a little citrus zest in the dough. The formula calls for osmotolerant instant yeast (SAF Gold), which is designed for high-sugar doughs. It is available from online sources such as King Arthur Flour, but if you don’t have it you can use regular instant yeast. Be careful when inverting the tray of hot sticky buns; if the hot glaze spatters your skin you will be very sad. Allowing it to cool for a minute or two makes this less likely. Lay a piece of parchment on top of the buns (still on their baking sheet), and a second baking sheet face down on top of that, so you have a “sandwich” with the two baking sheets as the bread. Grasp the sandwich firmly at each end, pressing the sheets towards each other while quickly flipping the entire thing over, away from yourself. Place all of the dough ingredients except the sugar and the butter in the bowl of a stand mixer. Mix in low speed until well combined. The dough will be quite stiff at this point. Mix for a minute in medium speed, then add the sugar in 4 or 5 increments, mixing for a minute or two between each addition. Continue mixing in medium speed until the gluten is almost fully developed. Add the softened butter all at once. Mix for a minute in low speed, then in medium speed until the butter is completely incorporated and the gluten is fully developed. Transfer to a covered container. Ferment at room temperature for one hour, then refrigerate overnight. When you are ready to shape and bake the rolls, line two baking sheets with parchment paper. At least one sheet must be rimmed. Portion the sticky bun smear into 8 dollops (each about 1.5 T.) spaced evenly on one (rimmed) sheet. Sprinkle the 75 g of coarsely chopped pecans on the dollops. On a lightly-floured counter, roll the chilled dough into a rectangle 22 inches long and 16-18 inches wide. Brush the entire surface of the dough with water, then sprinkle evenly with cinnamon sugar, leaving a 1-inch margin along one long edge of the dough. 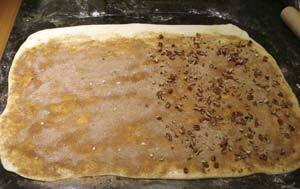 Starting at the edge opposite the sugar-free margin, roll the dough rather loosely into a log. Cut the roll into 16 rounds. 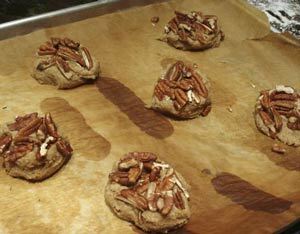 Place the 8 sticky bun rounds (the ones with the pecans) on top of the smear dollops and press down lightly. Evenly space the cinnamon roll rounds on the other baking sheet. Cover and proof for 1.5 hours at room temperature. Meanwhile, place racks in the upper and lower thirds of the oven and preheat it to 400F. 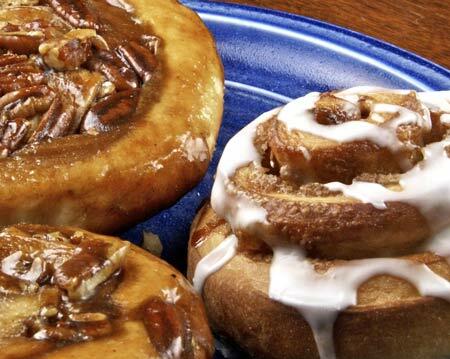 Bake for 12 minutes with the sticky buns on the bottom rack and the cinnamon rolls on the top. Then swap the positions of the sheets and bake for another 7 minutes or so, until the cinnamon rolls are golden brown. Remove the cinnamon rolls, move the sticky buns back to the bottom rack, and continue baking them for another 4 minutes or so. Make sure the bottoms (which will become the tops) are nice and brown. 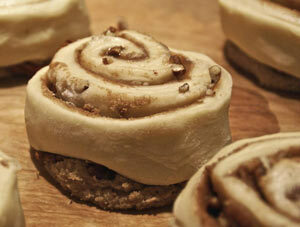 Slide the cinnamon rolls, still on their parchment, onto a cooling rack. While they are still warm but not hot, drizzle them with white icing. Once the sticky buns are out of the oven, let them cool for a minute or two, then invert the sheet of buns onto another parchment-lined baking sheet. Then slide the bun-laden parchment onto a cooling rack. Serve the rolls and buns while still warm. Store tightly covered until ready to use. Store in the refrigerator but bring to room temperature before using. Whisk in the lemon or orange extract and 2 T. of the milk. Continue adding milk slowly until the icing is a drizzle-able consistency. 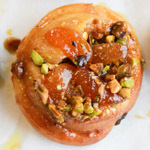 Arouse in the other person an eager want: Post about delicious looking cinnamon rolls and sticky buns. Start with questions the other person will answer yes to: Don’t these look delicious? Make the other person happy about doing what you suggest: If you go home right now and mix these up, you get to have all of them. A novel introduction to a beautiful subject! Very tempting rolls and a wonderful write up! I don’t need to bake these, why don’t I just slather the dough to my thighs? After all, I won’t be sharing them. Susan, can you just mail me some of that? It looks sooooo good. Oh, my coworkers will get these very soon…. You could probably run yourself all the way to president with these. It would be a pretty compelling incentive! These are amazing!! My, what an influential person you are. I could bribe my kids to do even more chores! I like the way you do the sticky buns. I’ll give that recipe a try soon. Hi, I just came upon your blog because I wrote about sourdough starter recently on mine– I love wild yeast! thanks for drawing me into the online bread community, I will certainly browse your recipes and keep reading the posts! Hey everyone, thanks so much for your comments! Gena Lora, I buy SAF Gold from King Arthur Flour, there’s a link above in the post. I have never seen it in stores. I’m gonna have to go with your advice instead of Mr Carnegie’s. I never thought that any phrase with “smear” on it would sound insanely appetizing. These look fantastic! As a kid I would pass up the donuts and get sticky buns instead. I’ve struggled a little with finding a really tender dairy-free dough since alternative milks don’t tenderize like cow’s milk. I like that your dough uses some cake flour and has the richness of eggs as well. I’m going to give it a try soon with soy milk powder and see how it works. I bet I could get a whole lot of socks picked up with these, thanks! Those buns look so good! You know Susan, I’m a big fan of your blog. Tks for sharing this recipe. They came out great and only with true will power did we stop ourselves from finishing them in one sitting!! I just made three recipes of the above using Peter’s Brioche recipe for Cinnamon Buns. 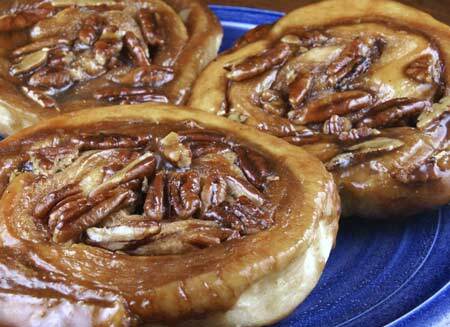 My grandmother used to make me sticky buns every Saturday morning growing up. They hold a very special place in my heart– and these look very similar to hers. I can’t wait to try this recipe. Susan, thank you for the lovely recipe. I was just switching the pans after the first 12 minutes when I noticed that the sticky bun smear was baking into a sheet of nutty brittle. I suppose placing the baking sheet directly onto the (newly purchased Fibrament) baking stone had something to do with it? :) I placed an upside down baking sheet right on top of the baking stone, so the sticky buns won’t be baking directly on the stone…but too late. It’s still delicious! 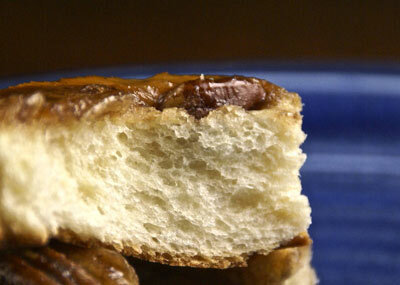 Kids love the sticky buns, and we love the sticky buns-even though the sugar hardened up to be like a brittle. First time making this and love it. What did I do wrong? Temp too high? That was the best first blog paragraph ever. 10 points for Gryffindor.